This was one of the 41 animals seized. She was also one of the few that was registered so we knew her actual age. One of the excuses that Lanette used was that the animals were old. Frequently, people do not realize that under all that wool is an animal literally starving to death. Unfortunately, this female was very pregnant and despite having had two weeks worth of good feeding prior to these evidence pictures, she was still severely underweight and malnourished. I had to shear her as evidence for the case of the severe neglect and lack of management that was going on. All of her filled out barrel was because of a baby. Below are more pictures and the actual details of the "Ferndale 41" that were the reason Info Day started. These were the actual evidence pictures taken of the 41 animals the day we rescued them. They show the poor care, condition, lack of forage on the property, fencing wire wrapped on feet, lack of shearing, poor body conditions and much more. Putting it mildly, it was pathetic and incredibly sad. Many of these animals died within the year after being rescued. Long term neglect causes permanent damage. The care, follow up, supplies, training, legal work, etc. became a full time job for well over a year for Jeff and Niki. Niki was the key witness in this case and testified for over 4 hours about each animal (which she knew intimately as she had been involved in their rehab and care). Lanette claimed that the animals were stressed from the seizure, hence their poor condition. Also, they were not show animals and instead, mountain bred packers. All lies.....There was no real water source on the property and Lanette lacked the funds and ability to feed and care for the 41 animals (plus two full size horses). When the volunteers went to geld the males, some of them had scarring so bad from Lanette's doing her own gelding that they resembled testicles. 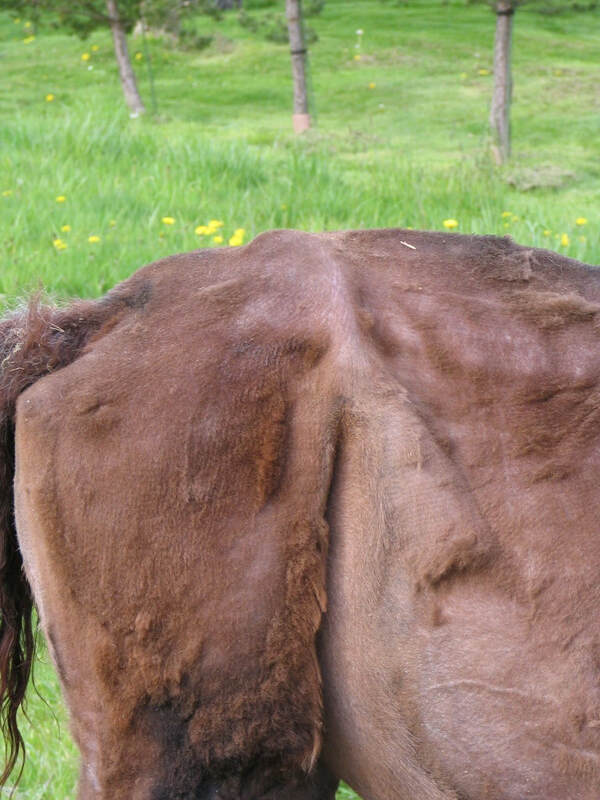 A very experienced veterinarian couldn't even tell that they had already been gelded. Some of the females had been kept on a property with arsenic in the water. These female's babies had brittle bones as a result and one shattered it's leg just stepping out of a trailer. One of the veterinarians claimed that the animals were fine. He was a small animal veterinarian and was only there for less than two hours during the seizure. In a few years, he lost his license due to some inappropriate choices. He had been out to Lanette's for a baby issue a few years prior to the rescue. This was the only record of any veterinary care being done on this herd. During the Summer the animals were used in a commercial packing business near Winthrop. With the Spring grass the animals would fatten up and while not sheared, did not appear to be ill or near death. As such Lanette's clients did not understand that the animals were starved all Winter but, okay during the Summer with pasture grass available. Irregardless of everything, this situation was a complete mess. The animals were all adopted out and Lanette was found guilty. Animal control at the time lost their contract over this situation and sadly, who knows how many animals actually perished on that property before this rescue. One of the many animals that died in Linette's pastures. This was the one that finally got everyone's attention. When we got on the property, we found llama bones and skeleton parts everywhere. I think most people in the llama community are tired of hearing about llama rescue and the unfortunate circumstances surrounding them. It isn’t that they don’t care, but how many times can you hear about the same unkept, overbred, malnourished and more circumstances? I think each and every one of us needs to look into what we do and how we sell our llamas. There is no way we can guarantee that our animals won’t end up in potentially dire situations. Could you live with this happening to one of your animals? On March 7th, I received an e-mail containing some pretty graphic pictures of a dead llama in a field. It was a request for help as nothing had been done to date about a llama herd of 40+ animals who were breeding and looked unkept. I made a phone call to the local Security Specialists Preferred (SSP who holds the county animal control contract) veterinarian Nancy Williams and told her to check her e-mail. After seeing the forwarded e-mail, Nancy called me and said she was trying to get a hold of SSP. Meanwhile the story of the dead animal who had been out there from at least the previous Friday was leaked to King 5 News in Seattle Washington and it went from there. 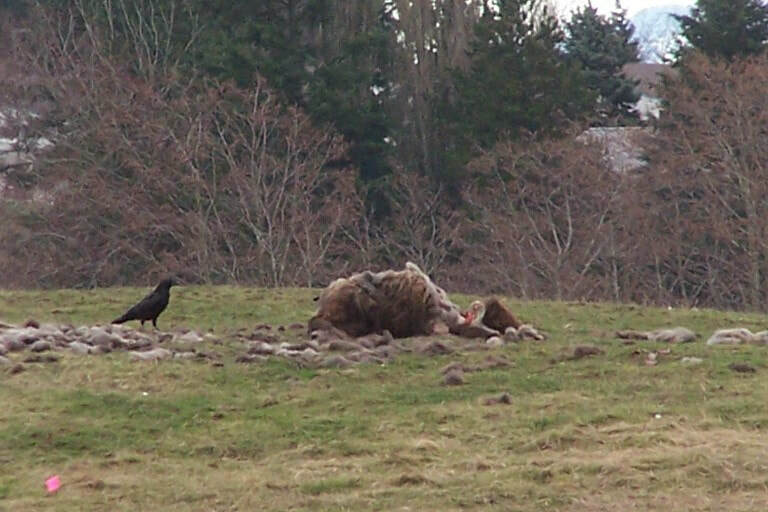 The next day (Thursday) King 5 was there and confronted the owner of the animals, even finding a dead cria in the ditch along the pasture. DVM Nancy Williams and a state veterinarian both assessed the herd and immediately determined there was a major issue going on. After staying up nearly all night to write a lengthy and detailed report, Dr. Williams turned in the findings from Thursday at 9:00a.m. which resulted in a determination by SSP right away to serve the property with a warrant. I was subbing (I am a teacher) that day and received a call from SSP at about 2:00p.m. wanting to know if I could have 41 llamas off a property that day? Completely caught off guard, I explained to the officer that I would need time to arrange for help, supplies and places for these animals The soonest I could help would be Saturday morning the next day. The quickest mobilization in history happened that Friday. I hurriedly made a trip to LOWES home supply and got the manager to donate plastic chain. I then hit the local feedstore (Laurel Farm and Western Supply) and got them to donate livestock number tags. This was the only way I could think of to humanely label the animals and not have to leave halters on. I ran by the property where the llamas were as I had never been there and needed to give directions. With no known structure on the property, it was in essence just a big pasture with no address! I got a glance at the animals who were happily munching hay and couldn’t help but get more worried about the next day. After staying up all night and worrying about having homes for the animals, if we would have enough help, if people might get hurt and just not knowing what we were going to find or deal with I got up at 5:00a.m. The plan was for everyone to meet at 7:00a.m. with panels, supplies, halters/leads and anything else they could think of. Gary Kaufman, Liz Martin, Dan and Kathy Kramer, Jim and Marilynn Larson, Chela Grey (her friend Uta Kramer), Mikie Morris, several local alpaca owners and more had shown up to assist. Additionally DVM Mike Anderson my personal veterinarian had set aside time to help for two hours that morning. We assembled the panels into a large catch pen and set-up a working station under a tent with the numbers, vet supplies and microchips. Dr. Nancy had decided it was VERY important to microchip all of the animals, which we were thrilled for! Halters and leads were laid out by size on the panels and scribers with clipboards were determined. The animals were herded in using food as a bribe. It was very chaotic at first, but finally a routine settled in after about the first ten animals and things went smoothly. Each animal was haltered, assigned a number, microchipped, body scored, checked for any scarring or evidence of neglect. Then they were wormed, given CDT and treated for lice with Ultrabos. Upon inspection most animals were between a 1-2 on a body score of 1-5 (with 5 being fat, 1being thin). Body scores were done by several seasoned volunteers and verified by the veterinarians. Once the assessment was done, the detective acting on behalf of the prosecuting attorney, would announce “Number ….is seized” and we continued working on the animals all day until about 3:00p.m. when the last animal was tagged. The only animal that had been deemed healthy aside from the lice was #41 a small female that was obviously very young. 41 animals were seized that day and three were immediately determined to be in need of euthanization based on their condition and or injuries. One was a young male that was already breaking down from the lack of proper nutrition and was severaly malnourished, another a female that was around 10-12 and had a horribly damaged rear foot and an elderly gelding who had some sort of rear hip issue going on and was a walking skeleton, He was the very worst of the whole bunch and brought several people to tears. Next came the task of where the animals could go for temporary foster care. One local alpaca owner kindly offered to take all of the mom’s and babies. A 4-Her and her mother declared they would take 41 and an adult female buddy for her. As we all stood around wondering who would take the rest, a wonderful man came up and someone said, “Talk to Niki she will help you.” This dear man lived down the road and had goats he had rescued. He also rescued elderly Dalmations and just felt sure he could find space for five of the llamas. Because he had goats, I decided that it would be best to send some females with him and we loaded a mom and baby up too for him to foster. Another wonderful couple came up and announced they were animal lovers that lived near by and had a fenced pasture, could they take some too? I found three of the older geldings who seemed quiet for them to take. They also felt like they wanted to take on a younger male there, but I wouldn’t let him go alone without another young male. So we weaned one of the obviously older male crias (whom we were going to wean the next week anyhow) and sent them together. Off my husband went to deliver the 10 animals and to check out their new foster homes. That had removed 20 and left another 18 in need of homes. Meanwhile after the last animal was tagged, a large number or police cars (15-20?) came over the hill and parked. If you have never had the experience of seeing that many police cars, it is very intimidating! They then all got out and walked the property in formation to collect evidence. Sweeping a second time with bags to collect the evidence and secure the property. It was decided that the rest would have to temporarily go to the local auction yard. They had been having a feeder cow sale all day and couldn’t take the animals until about 6:00p.m. The Kramer’s, Gary Kaufman, Dr. Nancy and I loaded up the remaining animals in our trailers and went for some dinner while an SSP officer guarded the trailers. 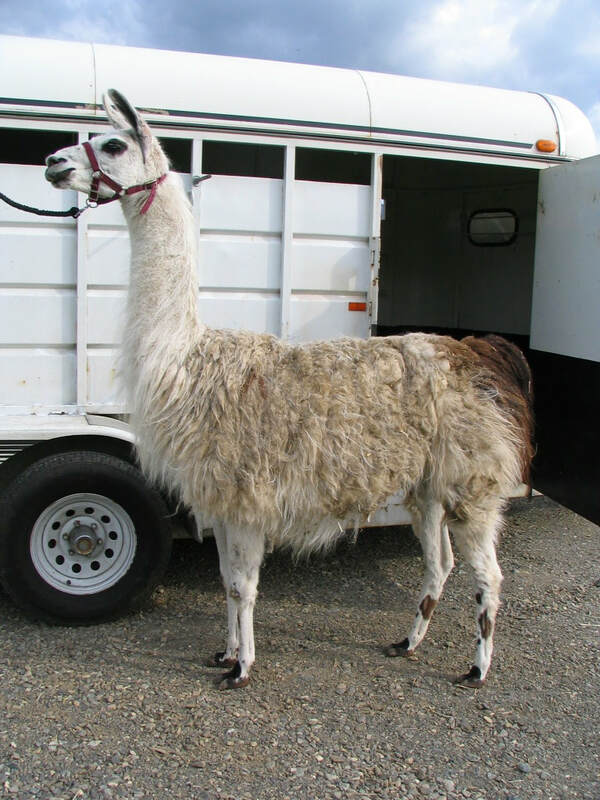 When we arrived at the auction barn it was obvious that they did not want the llamas there and the very nature of a place like that does not lend it self to being somewhere you would leave something you cared about. We carefully began unloading and funneling the animals down the maze of stalls to the pens where they would reside. It now became apparent that several more of the animals were in worse shape than we thought and should probably be euthanized also. One young gelding was actually leaning his rear against a board in the pen to hold himself up. Another female was so weak and broken down it was apparent that she wasn’t doing well. It was heartbreaking to watch them all and to have to leave them there with their food and water for the night. By the time we got home that night, there were already phone messages requesting to help foster the animals. By 7:00a.m. the next morning my phone began ringing off the hook and I sat in my office in my pajamas until 4:30p.m. screening potential fosters to temporarily house and care for these animals. I also made calls to feed stores to set up accounts for the feeding of the already fostered animals. The county executive (Pete Kremen) and a counsel member (Barbara Brenner) both called and offered support. Accounts were set up with specific instructions for what could be bought and care sheets were put together with feed instructions for the fosters. We also gave them care sheets that would explain what normal healthy llamas care and feeding was like for them to consider if in fact they did want to adopt the animals if the time came. There had been an ongoing concern that Lanette had more llamas somewhere that she had removed off the property. I talked to the county executive about this and he called the Sheriff’s office to personally make a request to go to her residence to see if more were there. My heart sunk about an hour later when they called to tell us that they had found more animals at her place of residence. I just couldn’t imagine trying to find spots for any more. Dr. Nancy went to the residence and quickly realized these animals were not part of the original group and were owned by an elderly man who had obviously been feeding and caring for them, what a relief! At 4:30p.m. I went to the auction barn and began meeting the potential fosters and SSP officers. Everyone was required to fill out paperwork and we then determined which ones would go with them. My husband Jeff, did the nails on all of the ones there that were being sent to foster homes. We hadn’t been able to do this the day before as most of the animals were exhausted from what had been done for them already. One local teacher who wanted to foster was able to pick up two with a borrowed van. The rest were loaded up and my husband and I went around until midnight depositing these animals in the pouring rain at their new foster homes. All 34 animals remaining were fostered out by the end of that evening! The next few weeks were a flurry of follow-up and talking to the fosters. Making sure everyone knew what to do and answering questions. I did have to go around and take halters off some of them as the owners did not know how. Any other time was spent answering questions over e-mail and talking to people. We were not able to worm the animals for everything they had as it would have killed them from parasite overload. So the worming needed to be repeated three weeks later with a different drug and the inoculations were repeated as a booster (Thank you Jim, Marilynn, Rezina, Alevia and my husband Jeff). I made sure everyone was given a health record of what had been done on their animals and that all had decent halters and leads. Three weeks after we went around with a vet and ultrasounded all the females we could and determined how far along they were if at all. One of the geldings (determined to be 12 years old) died within a week and by a necropsy it was decided that he died of complications from poor care and nutrition. He had been my personal favorite of the group rescued and the foster home took it hard as they had already grown very attached to him. They over a month later lost another one of the elderly geldings who just couldn’t make it. The day after we lost the elderly gelding, one of the females gave birth to a healthy male cria at another adopters house, Knowing that this adopter had two girls and couldn’t keep the male baby, he has graciously offered to give the cria to the adopters that have lost the two older geldings. 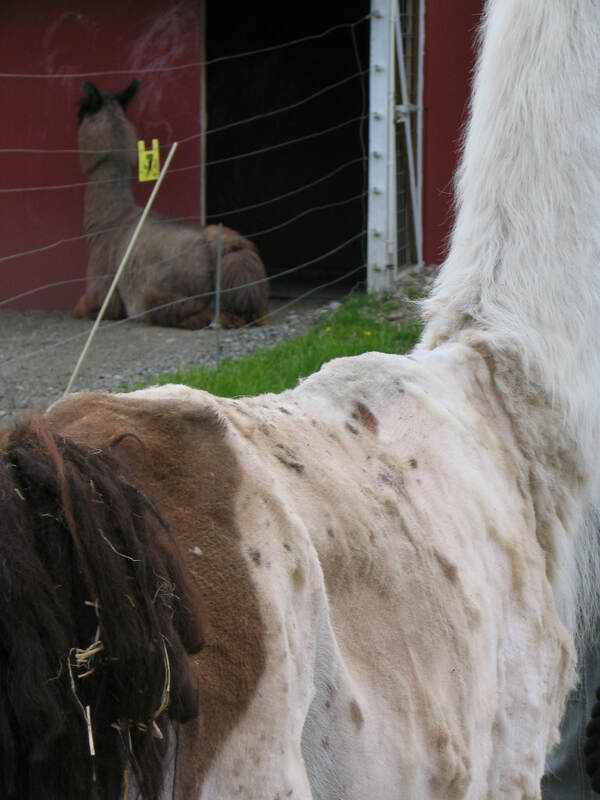 In an effort to deal with the fact that many of the fosters do not know how to care for llamas, a group of caring llama owners put together a llama day. Held on April 28th, this day provided classes on shearing, care, training, herd management and more! There was even a veterinarian (Dr. Michael Anderson of Kulshan Veterinary Clinic, 2005 LANA Hand in Hand Vet Award Recipient) on site to answer questions. This day was opened up to the public and offered to anybody that had camelids in the area. We had over 50 people that day and used some of the rescue funds to feed them so they would not have to leave! The positive side of this whole thing has been the many wonderful people that stepped forward to help these animals. Most have never owned llamas before and have been working hard to learn. Additionally, SSP has been working hard (despite the fact they lost their contract over this whole situation) to become educated on camelids and how to evaluate their conditions and care. They also were very committed to doing what is right for these animals. One of the SSP supervisors even adopted one of the intact males that was a behavior problem and has taken him on as her own personal project! People locally have contacted me to arrange shearing and other routine care as this situation has been in the forefront of the whole community. This area has never dealt with something like this before and I think it served as a wake-up call for everyone that they need to be better prepared for something of this nature and scale. All of this shouldn’t be falling on the shoulders of one llama owner who cares. There has been a taskforce (headed by Dr. Michael Anderson) formed to put together a plan for how to deal with animal emergencies in the future. We had many wonderful donations made and those were used so far for vet supplies, health records, education, toenail trimming and more. Shearing will be paid for in May with this money also. If any money is left, it will be used for training and education of the adopters. All but one have never owned llamas before and are very eager to learn! On April 13, 2007 Linette Smith went to court for the charges against her of 8 counts of first degree animal cruelty. She plead not guilty and requested to get the animals back. By this date however, they had all been adopted out and were placed so she may NOT get them back. Only time will tell how this will shake out and what will happen. I am so happy knowing she will not get these guys back! A huge thank you to the many supportive individuals involved with this situation, we could not have done it without you! Another one of the Ferndale 41 animals. This female was also very pregnant and is pictured after two weeks of heavy quality feeding. These pictures were part of the evidence used to prosecute Linette for her neglect and cruelty.